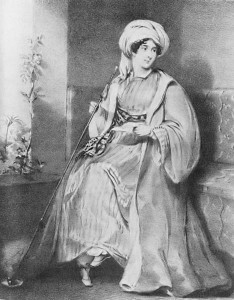 A 100 years before Lawrence of Arabia, Lady Hester Stanhope abandoned her aristocratic British life to travel around the Middle East, often travelling alone, adopting local customs and settling there. She survived shipwrecks, plagues and Bedouin attacks. She was the willful child of an eccentric father. She would have been very well known in the early 20th century but her exploits are less familiar today. A perefect addition to the We Are The 51 campaign then. Hester Stanhope was the eldest child of Charles Stanhope and Lady Hester Pitt. In her twenties she lived in Downing Street, when she became chief of the household of her uncle, William Pitt the Younger. As the British Prime Minister, and in keeping with the custom of the time and the requirements of his position, the unmarried William Pitt needed a hostess. Hester sat at his table and assisted in welcoming his guests and became known for both her beauty and her conversational skills. Following the death of Pitt Hester, aged 33, decided to leave the UK and take a long sea voyage. Her fame preceded her and it is even claimed that when her ship arrived in Athens, Lord Byron dived into the sea to greet her. En route to Cairo the ship was wrecked. Everyone survived by rowing to a nearby island. The party survived by taking shelter in a rat-infested windmill and it was at this point that Hester decided to dress as a man, attire she wore througout the rest of her life. Surviving on the island until rescued by a British frigate was transformational for Hester and instead of returning home, she carried on to Cairo and on into the Middle East — where she was greeted as a princess. She didn’t dress like a middle-eastern princess. She refused to ear a veil. She bought a purple velvet robe, embroidered trousers, waistcoat, jacket, saddle and saber and wore them when she met the Pasha. She was, according to long-time travelling companion Dr. Meryon, generally mistaken for a young Turkish bey “with his moustachios not yet grown.” Hester even began shaving her head like a Muslim man, apparently to make her turban fit more comfortably. In an act of complete madness she rode through the gates of Damascus, where women covered up and Christians maintained a low profile – unveiled. . Her appearance was at first greeted with a stunned silence but then, bizarrely, they started to cheer, spreading coffee around her horse in a gesture of respect and the crowd murmured that English royalty was in town. Emboldened by her conquest of hearts and minds in Damascus, she decided to visit the city of Palmyra, even though the city was virtually inaccessible at that time the route went through a desert populated and controlled by hostile, lawless Bedouins. So, she dressed as a Bedouin and travelled quietly with a group of friendlier Bedouins, though she did also take with her a caravan of 22 camels to carry her baggage. She must have been something to behold – a tall, pale-skinned English lady in pantaloons and turban riding at the head of a caravan of camels! The journey wasn’t without incident, of course, and Hester herself once defended the camp herself by standing in the centre, a gun in each hand, to confront brigands who were demanding additional protection money. But Hester was undeterred and pressed on to become the first European woman to reach Palmyra. On meeting the Emir Hester is reported to have said, “I know you are a robber and that I am now in your power. But I fear you not. I have left behind all those who were offered me as a safeguard … to show you that it is you whom I have chosen as such.” The Emir was captivated – of course. During her later travels she came into possession of a medieval Italian manuscript; a treasure map promising vast riches hidden under the ruins of a mosque at the port city of Ashkelon. Hester set out for Ashkelon and persuaded the Ottoman authorities to allow her to excavate the site. Thus, while failing to find treasure, Hester became responsible for conducting the first ever archaeological excavation in Palestine. In her latter years, her life became even more chaotic. Eccentricity morphed into megalomania and she believed herself to be Queen of the Jews, making amongst other pronouncements, “I have been crowned Queen of the Desert. I have nothing to fear…I am the sun, the stars, the pearl, the lion, the light from heaven”. She had an elaborate house built in Lebanon, with vast mazelike. Her last act was to dismiss most of her servants and order the construction of a final wall which sealed her into her own home. She died several days later, impoverished and alone.